Why LTC Can Hit In 2018! HOW LTC CAN SOAR TO IN 2018 AND WHY LTC IS THE #1 CRYPTOCURRENCY OF THE YEAR 2018! Satoshi Nakamoto is said to have created bitcoin, the world’s first cryptocurrency and utiliser of blockchain. The blockchain code is open source (versus proprietary), which means it is free to be be modified by anyone for new projects and application. As a result, it has inspired the formation of many new forms of cryptocurrency using versions of this code with varying degrees of success. Litecoin’s launch was announced in 2011 with the goal of being considerded the digital equivalent of silver just as bitcoin is considered digital gold. In 2014, Litecoin had the second highest market cap of any mined cryptocurrency after bitcoin. 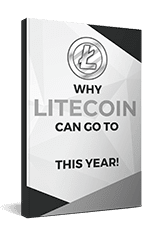 Litecoin was created in October 2011 by Charles Lee, a former Google engineer, with the intention of improving upon bitcoin. Just like bitcoin, litecoin is is generated by mining. The key difference of litecoin for users, however, is the 2.5 minutes it takes to generate a block, as opposed to 10 minutes for bitcoin. Charles Lee now now works for Coinbase, an extremely popular online bitcoin wallet. For miners and cryptocurrency enthusiasts the really significant difference between litecoin and bitcoin is its proof of work algorithm. Bitcoin relies on the SHA-256 hashing algorithm which uses calculations that can be greatly accelerated in parallel processing. This characteristic has given rise to an intense race in ASIC technology, and has exponentially increased bitcoin’s difficulty level. Litecoin, however, uses the scrypt algorithm, formerly known as s-crypt, pronounced as ‘script’. This algorithm instead uses the SHA-256 algorithm, but with calculations which are much more serialised than those of SHA-256 used by bitcoin. Scrypt prefers large amounts of high-speed RAM rather than raw processing power alone and is subsequently known as a ‘memory hard problem’. Using scrypt means that there has not been as much of an ‘arms race’ in litecoin nor in other scrypt currencies because there is no ASIC technology available for this algorithm. However, this will soon change thanks to companies like Alpha Technologies. To illustrate the difference in hashing power, in 2014 the total hashing rate of the bitcoin network is over 20,000 Terra Hashes per second. Meanwhile that of litecoin is just 95,642 Mega Hashes per second. For the time being the most advanced litecoin mining rigs are custom PCs fitted with multiple graphics cards (ie: GPUs). These devices can handle the calculations required of scrypt with access to incredibly fast memory built into their own circuit boards. Originally when first launched, people could use GPU mining for bitcoin, but ASICs have made this method completely futile. The main difference between the two forms of cryptocurrency is that litecoin can confirm transactions must faster than bitcoin. As a result, litecoin can handle a higher volume of transactions due to faster block generation. For bitcoin to match this, it would require significant updates to the code that everyone on the bitcoin network is currently running.The disadvantage of the higher volume of blocks is that litecoin’s blockchain will be proportionately larger than bitcoin’s and have more orphaned blocks. Litecoin’s faster blocktime also greatly decreases the risk of double spending attacks in the theoretical instance of both networks having the same hashing power. A merchant waiting on two or more confirmations would only spend five minutes with litecoin, whereas they would have to wait 10 minutes for even one confirmation with bitcoin. Transaction speed (or faster block time) and confirmation speed are often dismissed as moot points by many bitcoin enthusiasts, since a great many merchants would forgo confirmation in order to make the sale. However,it’s important to clarify the actual transaction itself is instantaneous; its confirmation by the network as it propagates is what leads to the wait.